Economic losses from natural catastrophes in Korea were KRW 187.3 billion in 2017, down 37.2 percent from 2016 due to the absence of typhoon losses. This figure remained well below the recent ten-year average of KRW 348.6 billion. 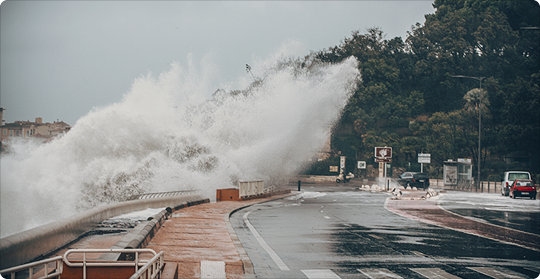 Natural disasters were estimated to have cost the insurance industry KRW 32.5 billion in 2017, according to the data from Korean Re's inward business. By peril, heavy rain was the largest source of natural catastrophe losses, accounting for 54.2 percent of the total economic losses. There were a total of 17 heavy rain events. Heavy rain occurred mostly in summer from late June through September, resulting in economic losses of KRW 101.6 billion and insured losses of KRW 14.3 billion in 2017. Earthquake was the second largest peril with a 45.4 percent share. An earthquake with a magnitude of 5.4 hit the southeastern city of Pohang on November 15, 2017. It caused massive damage to schools, public buildings, cultural properties and residential buildings. As a result, economic losses reached KRW 85 billion while insured losses topped KRW 17.9 billion. The Pohang earthquake was recorded as the second largest in the country's modern history after the 2016 Gyeongju earthquake that occurred on September 12, 2016. 1) The insured losses are based on data from Korean Re's inward business.